Hope you all have a great Christmas and a happy New Year! One of my all time favourite comic book characters has to be Reed "Mister Fantastic" Richards of Marvel Comics' Fantastic Four. He's a born leader, a super-genius and the Marvel Universe's ultimate father figure. But these factors are only part of what makes him so appealing to me. Reed's a much more interesting character than he first seems. 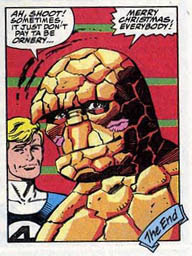 You see, in the fifty years since Stan Lee and Jack Kirby created the Fantastic Four it's been pretty well established that Reed is just one bad day away from going completely batshit insane. Seriously, this guy is the cleverest person on the planet and he's just one hissy fit away from deciding that everyone on Earth doesn't really know what they're doing and he'd be better off just taking over. There is of course one thing that keeps Reed grounded and stops him from crushing us all like the intellectual cockroaches we are. His family. The rest of the FF. Whenever Reed starts losing it, his wife, his brother-in-law, his best friend, his two children and sometimes even his deadbeat, time-travelling dad all manage to keep him on the straight and narrow. But what if Reed lost his family? This is why Alternate Universe versions of Reed Richards are so much fun! Like most alternate versions of popular characters they offer us a glimpse of such scenarios as; what Reed would be like if he had different powers, or no powers, or if Spidey joined his team! But many of these multiversal doppelgängers also offer us a glimpse of what Reed would be like if he lost everything that linked his mighty brain to humanity and went completely barking mad. It's fascinating stuff, and it's a concept that's been used most recently by current Fantastic Four writer Jonathan Hickman. 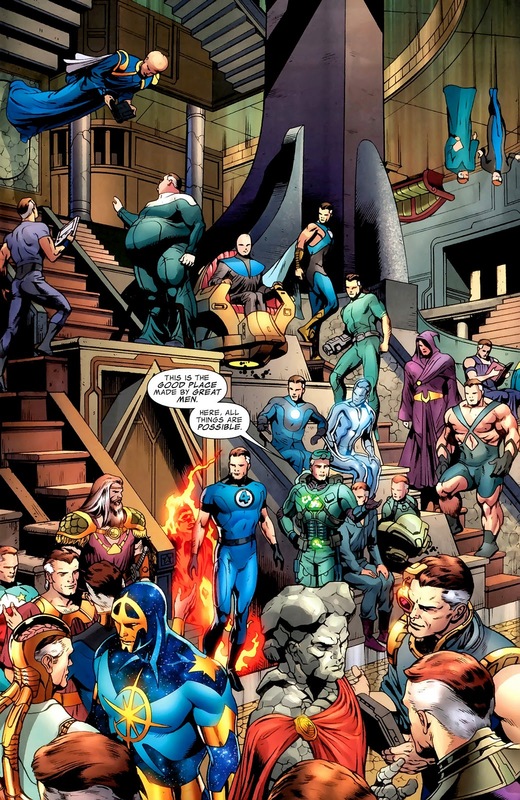 Hickman has introduced us to the Council of Reeds, a gathering of different versions of Reed from countless alternate universes, all united towards a single goal; solving everything! Unlike the regular Marvel Universe Reed, each member of the Council has turned his back on his family in order to totally focus on this goal. As you can imagine this has left them slightly less in touch with humanity than regular Reed. The Council has a huge variety of alternate Reeds. Their membership includes Human Torch Reed, Silver Surfer Reed, Swordsman Reed, Rock Head Reed, Muscle Reed, Fat Reed, Arc-Reactor-In-His-Chest Reed, and..er..Reed with Goggles. But there are still many other Alternate Reeds that are conspicuous by their absence from the Council. The following list is devoted to them. The Reed of Marvel's Ultimate Universe is pretty similar to Reed 616 except for three major differences. 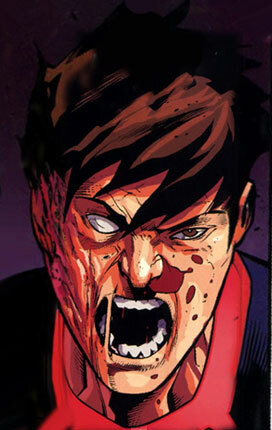 For starters, Ultimate Reed is a much younger version of the character, he's in his late teens rather than middle age. 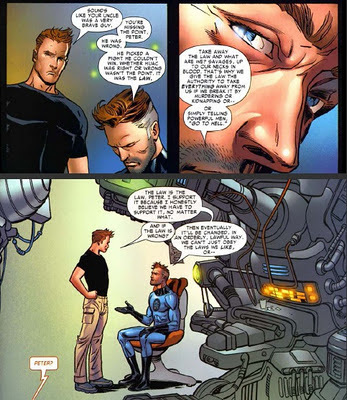 Secondly, Reed 616's father is Nathaniel Richards, an absentee dad who nevertheless nurtured Reed's keen scientific mind during the brief time he spent with his son. On the other hand Ultimate Reed's father is Gary Richards, a brutish oaf who favours athletics over more academic pursuits and has no time for his genius son. 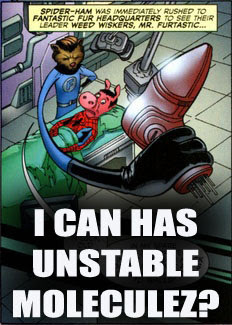 And the third, and most important difference between 616 Reed and Ultimate Reed? 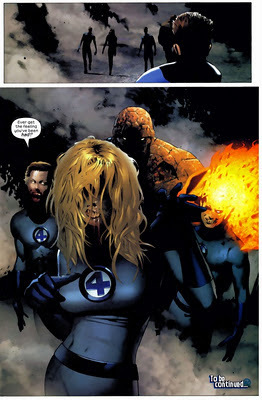 Ultimate Sue Storm gave Reed the elbow! To cut a long story short, in Ultimate Doom #4 (2011) Ultimate Reed went crrraaazyyyy, killed a bunch of people, beat up Sue and teamed up with some aliens to do evil stuff. When he eventually clashed with his former team mates he was even given some Doctor Doom style scars courtesy of the Human Torch. And you think your ex is a nutbar! He was last seen escaping from the Negative Zone and promising to "solve everything", just like the Council! 616 Reed has made a similar promise but Ultimate Reed's solution probably involves something evil, like torturing kittens. Long before he went evil Ultimate Reed built a device for communicating with parallel universes. He made contact with what appeared to be the 616 Reed, who showed Ultimate Reed his wife, his children and his cool grey sideburns. Ultimate Reed hopped onto the first cross-dimensional teleporter over to his doppelgänger's universe, only to find one of the best final page cliffhanger/reveals ever! Even more disturbing than that is the way the Zombie FF were first infected. In Marvel Zombies: Dead Days (2007) we once again witness an alternate Reed going barmy, this time as a result of the death of his children at the hands of Zombie She Hulk. Reed decides that the Zombie virus is actually the next step in evolution. He deliberately infects his team-mates and then encourages them to infect him, all the while wearing a look of orgasmic glee on his face. Maybe the Council didn't invite him to join because they were intimidated by his manliness? 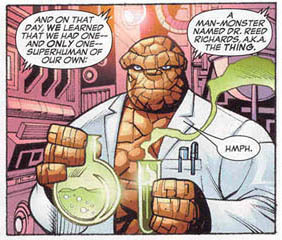 As all Marvel fans know, Reed's costume stretches with him because it's made from Unstable Molecules! 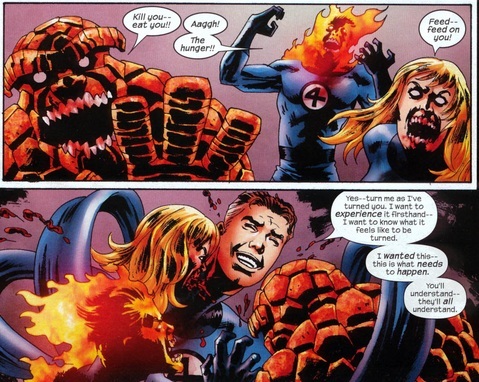 It's the same reason Johnny Storm doesn't set his pants on fire. But have you ever wondered what would have happened if Reed hadn't invented Unstable Molecules? No, me neither. Nevertheless, What If #34 (1982) provided us with an answer. 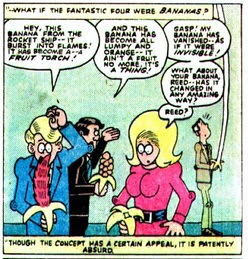 Fred Hembeck asks the question "What if the Fantastic Four were bananas?" 'Nuff said. "Yeah, let's make this quick Reed, 'cos let's face it I'm probably going to try and clobber you over the head and steal your life!" Personally I don't know what he's moaning about. Apparently he lives in a castle and builds robots all day. Sounds like a good life to me. Neil Gaiman's brilliant 1602 (2003) asks; what would the Marvel Universe be like if all its characters were around in the year 1602? Among the many heroes found in its pages is Sir Richard Reed, leader of the Four of the Fantastick. Like his 616 counterpart he is a stretchy super genius. In fact Sir Reed may be even cleverer considering he's actually figured out that he and his friends are part of a story and are slaves to its narrative! In Fantastic Four #392 (1994) the identity of the mysterious villain known only as the Dark Raider is revealed. It is of course, another Reed Richards. This Reed is from a universe where the FF failed in their first battle to stop Galactus from eating the Earth. The 616 version of this event was wrapped up when the Watcher sent Johnny Storm to fetch the Ultimate Nullifier from Galactus' spaceship. 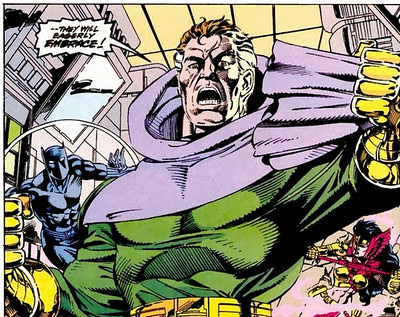 In the Raider's Universe the Watcher sent Reed instead. Reed, being the curious sort, spent too long buggering about with all the gadgets on the spaceship and by the time he got back Galactus had finished his meal, paid the cheque and presumably moved on to a cosmic nightclub. As in so many other Universes, the loss of his family drove Reed 'round the twist, and he decided that the only logical next step was to roam the multiverse slaughtering other versions of himself. Of course, the Dark Raider's biggest crime was the murder of Cravat Wearing Explorer Reed, who would have no doubt added some much needed style and panache to the Council. In What If #6 (1977) we see what would have happened if the Fantastic Four gained different powers. In this Universe the cosmic rays granted them powers that more accurately reflected their personalities. Ben gained wings, since he was a pilot, Johhny, the car enthusiast, gained a metal body and Sue gained stretchy powers because she..er..likes doing yoga? Reed definitely drew the short straw. 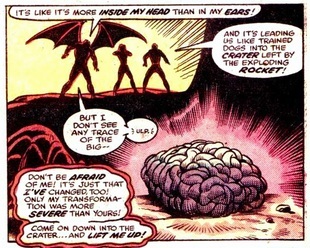 Since he's a brainy bugger he turned into a giant brain! I guess we should be thankful that Reed wasn't a prolific lover or a compulsive masturbater. That wouldn't have been pretty! At the end of the story Reed ends up switching bodies with Doctor Doom. After existing only as a disembodied spongy mass, facial disfigurement must seem like a doddle. The leader of the Fantastic Fur and friend of Peter Porker, the Amazing Spider-Ham! Maybe if the Council of Reeds had counted this guy amongst their members they would have had more luck "solving everything"! HE'S SOOOO CUTE! So there we have it! 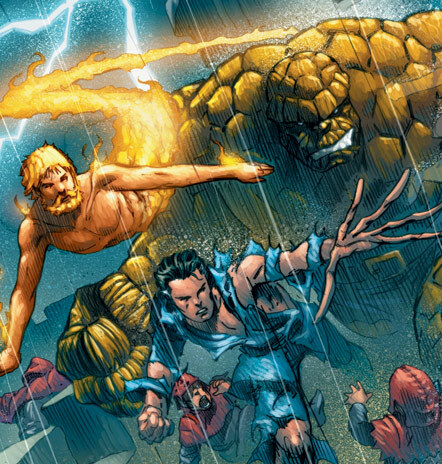 Ten alternate versions of Reed Richards that show us what might have been. Some of them are goofy, some of them are creepy, some of them are pure evil. All of them are fascinating. As for good ol' 616 Reed, we can rest safe in the knowledge that there's no chance of him doing anything as crazy and out of character as any of these guys, right? Oh yeah, that. 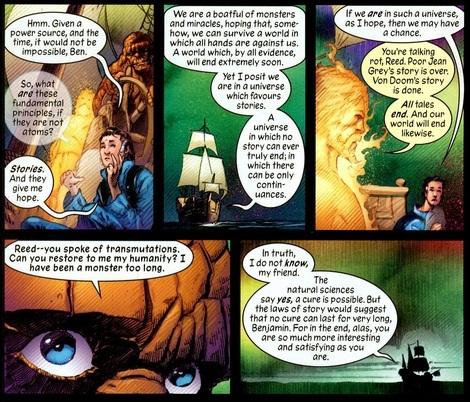 Thanks a lot Straczynski!